The report on the racial and ethnic breakdown of voters in 2012 released Wednesday by the Census Bureau attracted lots of well-deserved attention. But for readers of political tea-leaves, a report the bureau issued last December tells an even more compelling story. That report projected the racial and ethnic makeup of the U.S. population through 2060. If you combine key numbers from those two Census Bureau reports into a single chart, as we’ve done below, you’ll get a feel for a political and demographic drama that’s going unfold over the next half century. And if you’re a Republican thinking of running for president one day, you may be a bit concerned. The seven columns on the left side of the chart show how the white share of the vote for president has steadily declined over the past quarter century. 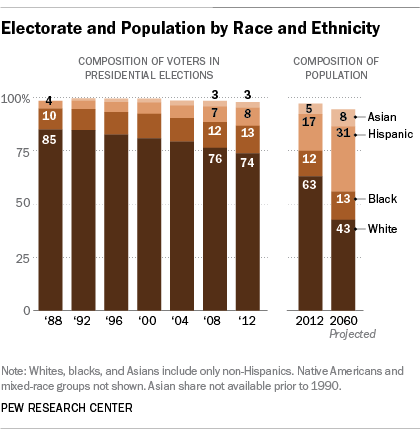 The two columns on the right show the racial composition of the population now and in 2060, as projected by the Census Bureau. A couple of patterns stand out. First, whites were 74% of voters last year at a time when they were just 63% of the population. This racial turnout gap is driven by the fact that a disproportionate share of non-whites are either too young to vote, not eligible to vote (because they’re not citizens), or just don’t vote. All of these factors could change over time. Second, if we look at the 2060 projections, we can see that there’s a lot more diversity yet to come. The Census Bureau makes its projections based on an analysis of fertility rates, mortality rates and immigration trends. They’re not set in stone. Things change. But they give a sense of the general direction of things. And many of these future demographics are already a reality—for example, about half of newborns in 2010 were non-white. In 2012, Mitt Romney captured just 17% of the non-white vote overall, according to the national exit poll, including 6% of the black vote, 27% of the Hispanic vote and 26% of the Asian-American vote. Unless future Republican presidential candidates do better with these groups, the electoral math will keep getting more difficult for the GOP.